…was recorded during the 2017 ‘All Night’ North American acoustic tour and sees John, Paul and Frank performing a selection of songs from their back catalogue – some for the first time in many years. 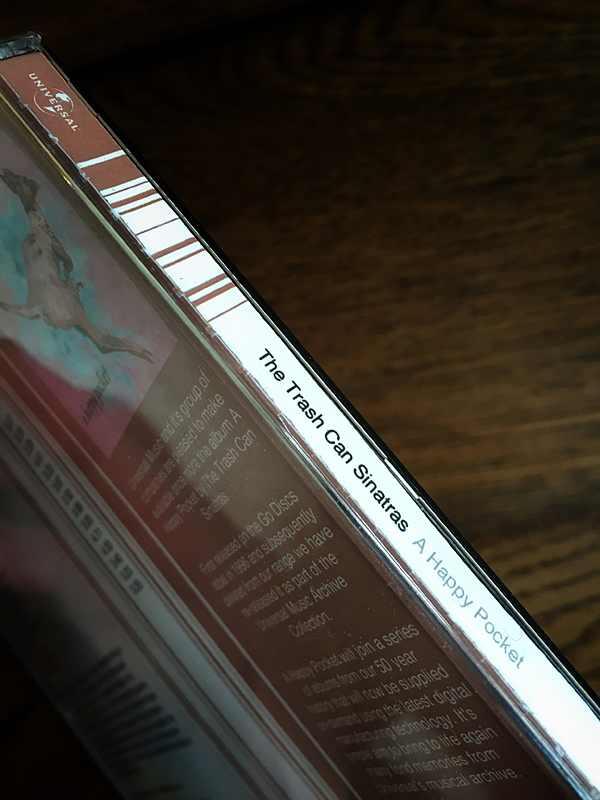 ‘Wild Pendulum’ is the sixth album from the Trashcan Sinatras – and it’s a triumph. Coming seven years after previous album, ‘In The Music’, Wild Pendulum was released with some help from the band’s loyal fan base, who donated in various ways through their Pledgemusic campaign. You could’ve bought a CD, a T-Shirt, a vinyl, a bedtime story, a guitar lesson or even a guitar itself, if you were feeling flush. It’s been a great campaign for the band and those who pledged have been rewarded with a wonderful album. There’s a different feel to the songs this time with strings and things driving the music along while the guitar riffs get locked up in the back seat. 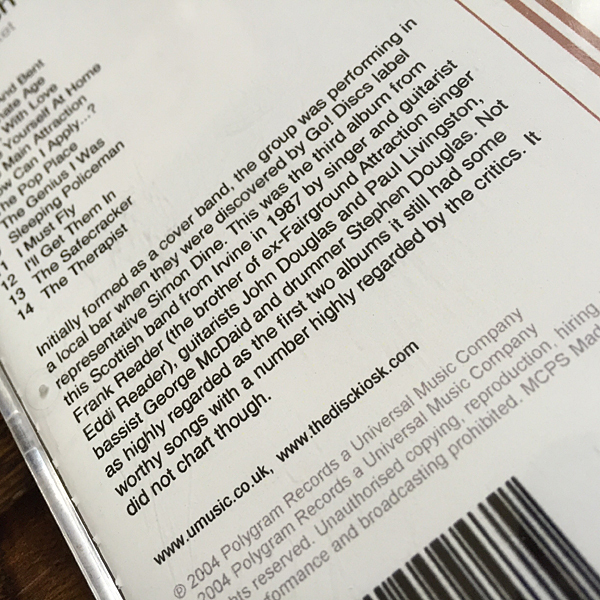 However, don’t let that put you off, they do get unbuckled for a few lovely solos, particularly on track 7, The Neighbours Place – a track which shuffles along at a pace similar to In The Music’s ‘Oranges and Apples’. 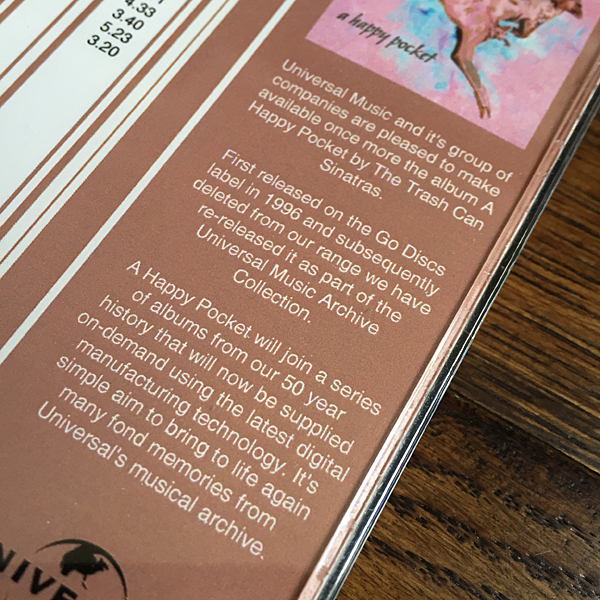 There’s also another nice little touch on track 3, Ain’t That Something – about half way through, there’s a wee tip-of-the-guitar to ‘The Genius I Was’ from third album ‘A Happy Pocket’ – at least that’s what I hear. Simon Dine, who many years ago signed the band to Go! 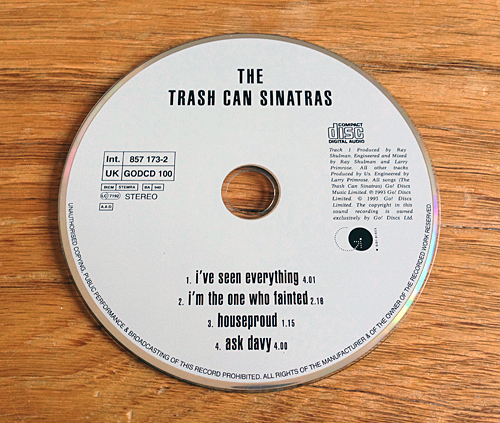 Discs, makes a return – adding some rickety Disney-esque flourishes, and, according to the sleeve notes, some ‘sonic scenery’. The whole thing was then brought together by Mike Mogis. 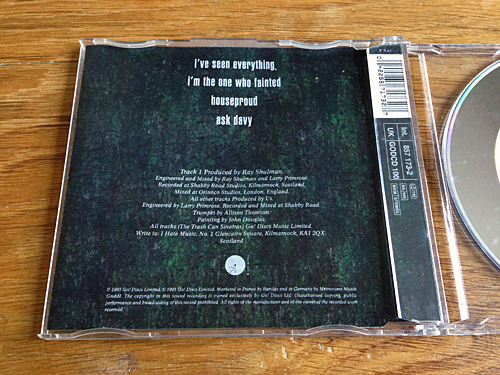 If you’re a fan of the work of Conor Oberst, you’ll recognise Mike as a member of Conor’s Bright Eyes project. Mike has produced and performed on a number of releases on Nebraska’s Saddle Creek label and also sprinkled his magic on two albums by Swedish folk duo, First Aid Kit. The artwork and design on the sleeve is wonderful. Designed by ‘How It Is Nowadays’ who are based in Brooklyn, New York. 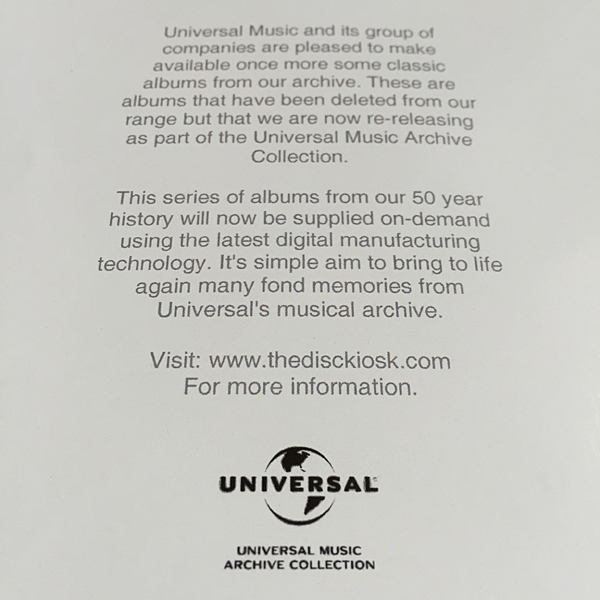 …Music Archive Collection was set up to bring back to life some long lost, out of print classic albums. Albums by artists such as ABBA, Big Country, The Style Council, The Jam and eh – one of Paul’s favourites – Wet Wet Wet. 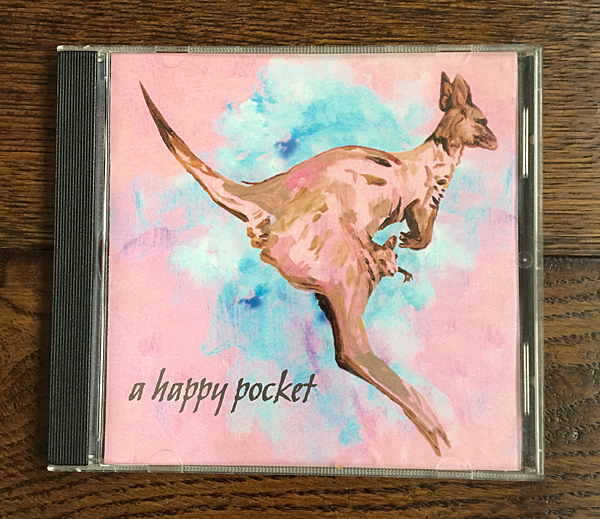 Back in 2004, ‘A Happy Pocket’ by the Trashcan Sinatras was also given the nod to be re-released – it is a classic after all. Most of these releases were interactive CD’s. 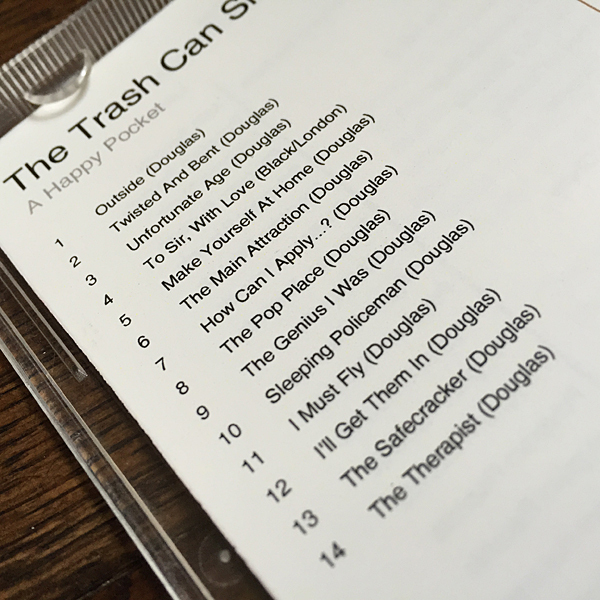 Pop them into your Mac or PC and some additional material was available for you to peruse while listening to the audio. Don’t know what’s wrong with my copy but it disnae work. 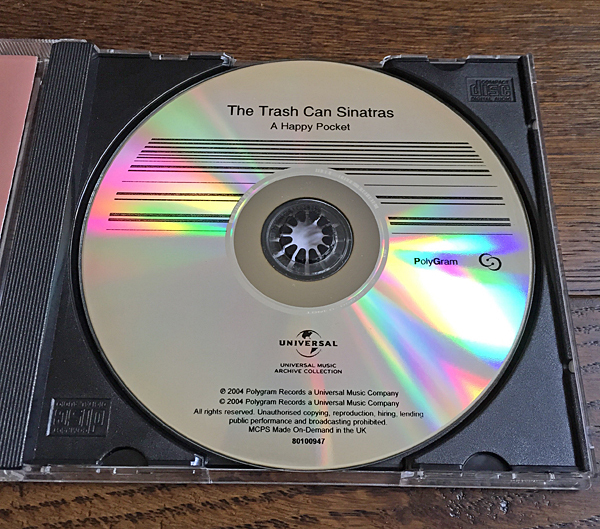 It’s a very clever idea and may have been a godsend if you’d been searching for what was once, one of the elusive Trashcan albums. Not so, if you were the band. I can’t imagine they would’ve seen any of the proceeds from the sale of this edition. …is, according to Google Translate, German for ‘I’ve Seen Everything’. I thought I’d seen pretty much everything when it comes to TCS memorabilia, and then just to keep me on ma toes – this popped through my letterbox. 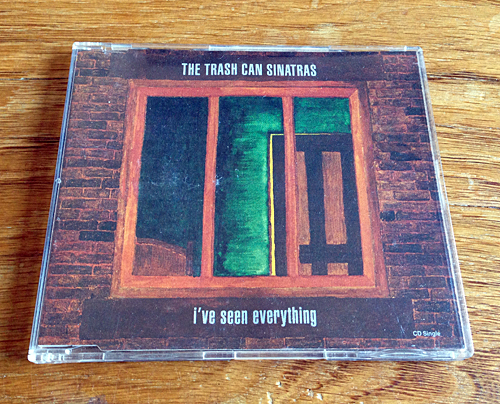 It’s the European release of fifth single, ‘I’ve Seen Everything’, and it’s all very different to the regular releases. 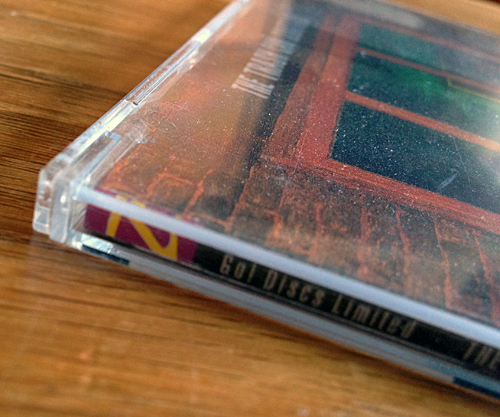 This one is in a jewel case, the CD is grey in colour and the anchor on the spine has the colours reversed – magic! 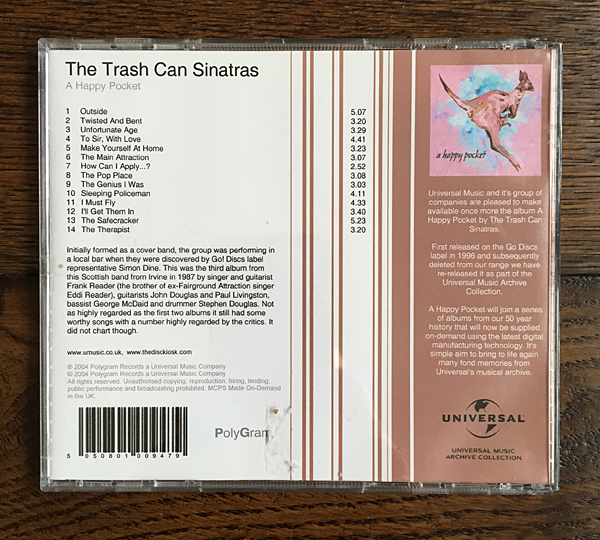 ‘Small Towns and Famous Nights’ is the first official band album from The Alan Kelly Gang – see previous post for more info on Alan Kelly – and includes a track penned by the Trashcans’ John Douglas. ‘Connemara’ is sung by Eddi Reader and was inspired by John’s recent discovery of details of his Connemara Grandfather, John Keane and family, all of whom were singers, musicians, fisherman and tale tellers (the boy’s from good stock don’t you think?). The song tells the funny story of his great Uncle Colm Keane’s first meeting with Seamus Ennis in the 1940’s when Seamus was collecting songs in Connemara for Alan Lomax, one of the great field collectors of folk music of the 20th century. The two men became great friends with Colm being the source for over 200 songs. It’s another great song and another great album. Hopalong and buy it here. It won’t disappoint.